This is July, 1964. I am 11 years old and this is my first trek up Mount Mcloughlin in the southern Oregon Cascades. 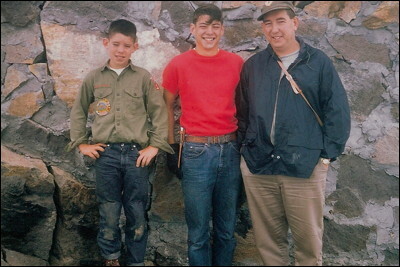 I am on the summit with my older brother Dave and my father Shirrel. One of us looks pretty tired! The rock wall behind us is the foundation for the fire lookout that used to be on the summit.